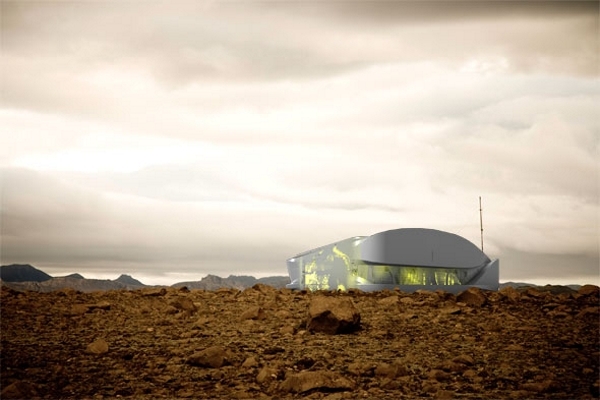 The Hydro House by Rael San Fratello Architects is a conceptual design which, using water, creates a micro climate in desert regions to regulate internal temperatures. A roof pond along with a pond in the courtyard and a unique water retaining wall system are the primary water sources. Through evapotranspiration, breezes penetrate the outer courtyard’s skin and are cooled as they crosses the water surface and then into the home. A large operable skylight on the leeward side allows air to escape, and by stack effect draws air through the structure. The thick walls collect and store rainwater that overflows from the roof pond. The water’s thermal mass in the walls along with the roof act as a thermal flywheel. By absorbing the heat of the day the mass then expels it at night, moderating internal temperatures. The top of the walls also house planters which help shade the roof. A white patina also assists in reflecting unwanted daytime heat gain. 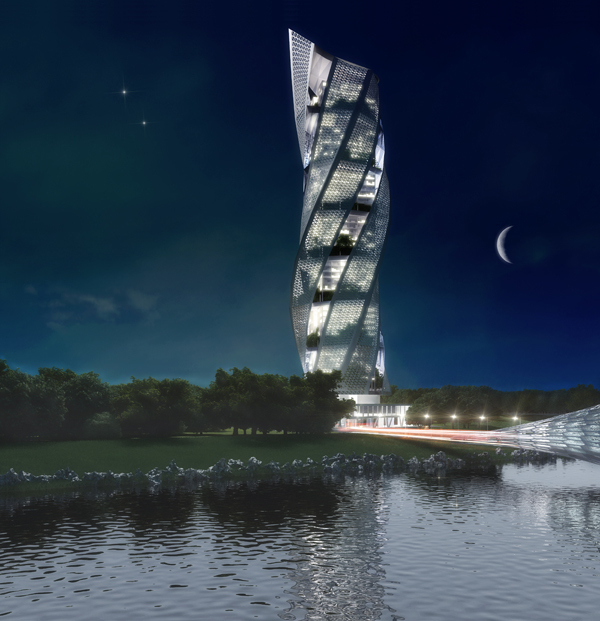 The Centre for Promotion of Science in Belgrade, Serbia designed by Austrian architect Wolfgang Tschapeller will be an institution of service and a national bank of knowledge in the field of science. 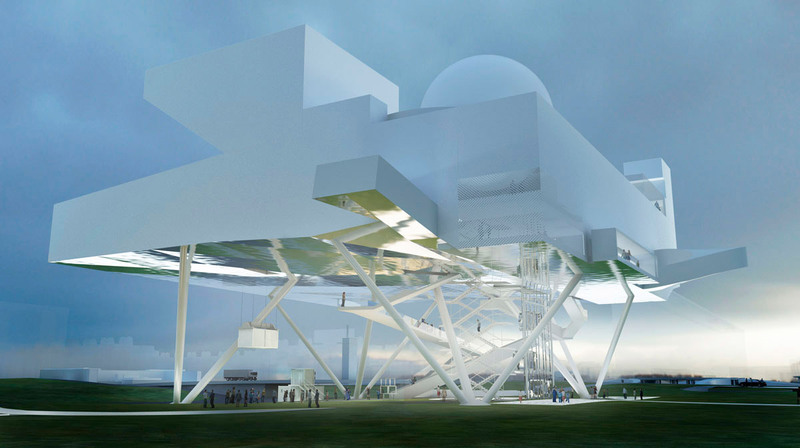 It will organise innovative and educative exhibitions, and bring science closer to the people. The main goal of the Centre for Promotion of Science will be to facilitate scientific education, a continuous training as well as social and economic growth, both with direct action, and in partnership with other actors – primarily the Ministry of Science and Technological Development and the Ministry of Education. The design for the Kaohsiung Cruise Terminal by Emergent is interior driven, biasing building section, and interior spatial effects. The goal is to create a cavernous space which will appear simultaneously massive and lightweight. The project oscillates between volume and surface, avoiding the limitations of exclusively surface-based and volume-based architectures. 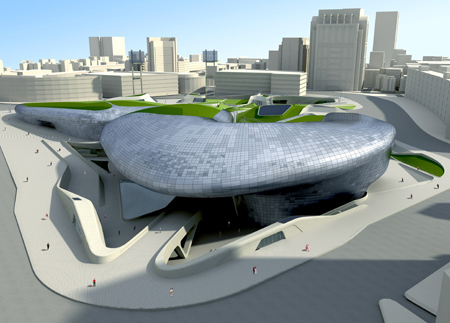 The new Kaohsiung Marine Gateway Terminal designed by Asymptote is a new state of the art transportation interchange, an urban destination with both terminal and public facilities including exhibition and event spaces for the people of Kaohsiung as well as for national and international visitors. 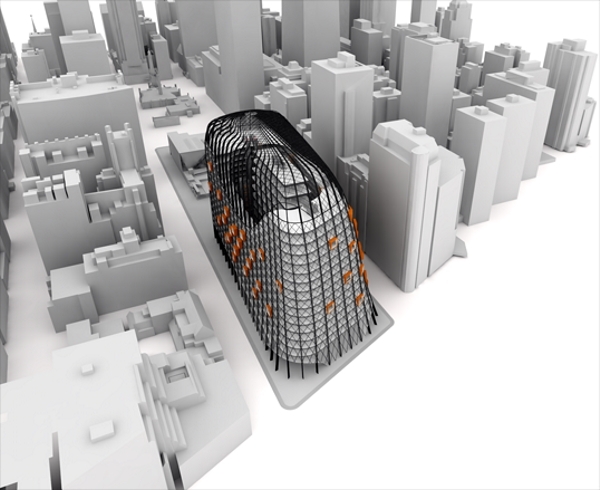 The project transforms the site from its industrial roots into a dynamic urban hub and a global gateway that bring a powerful and electric experience to the city 24 hours a day. 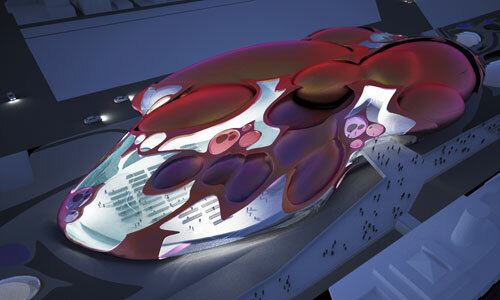 The port terminal as envisioned by Asymptote is designed to invigorate and activate Kaohsiung’s city edge at the water. 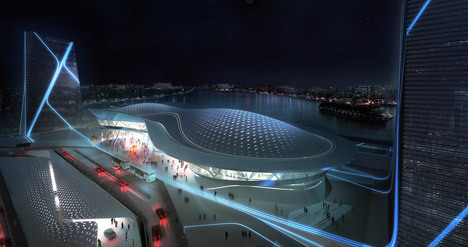 The port terminal extends the urban realm from the center of Kaohsiung to the city’s waterfront and connects this new urban space with the vitality of the future Pop Music Center and other public recreational and commercial activities that are to be located along the planned park at water’s edge. 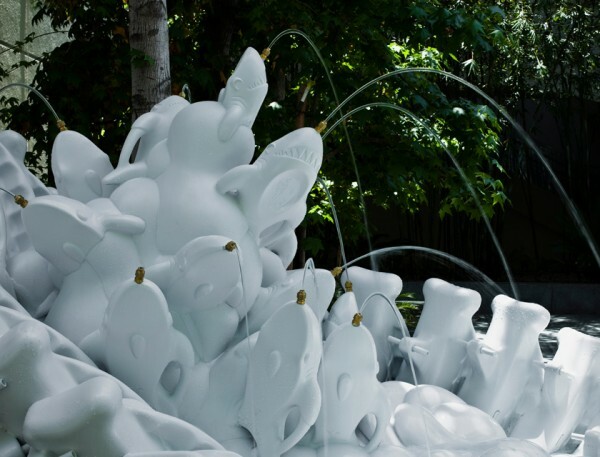 Greg Lynn’s Fountain is the first architecture and design project guest-curated by architectural historian Sylvia Lavin. As part of Hammer Projects, Lavin will organize a new project approximately once a year over the next three years that will present new works by architects and designers. These projects will be sited in different locations around the Museum. Boston-based architect E. Kevin Schopfer in collaboration with Tangram 3DS (visualization) envisioned “Harvest City” in Haiti as a floating agricultural / light industrial city off the shores of the island. Harvest City would be a vibrant fully functioning city of 30,000 residents which embraces three major concepts. 1. The creation of an artificial, floating, productive and livable land desperately needed for Haiti. 2. 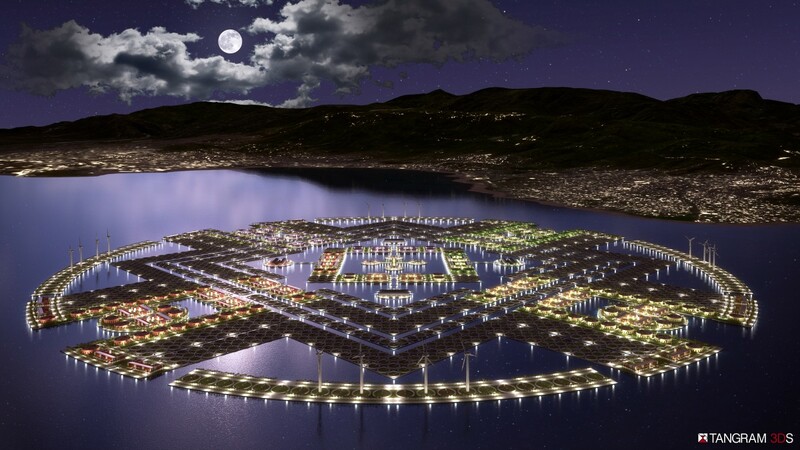 A city designed based on the principle of Arcology (Architecture and Ecology) which embodies an ecologically sustainable and practical urban platform. The 85,000 square metre Dongdaemun Design Plaza designed by Zaha Hadid Architects will establish a learning resource for designers and members of the public with a design museum, library and educational facilities, whilst the 30,000 square metre Park will create a green oasis within the dense urban surroundings of Dongdaemun, Seoul. The form of the Dongdaemun Design Plaza and Park revolves around the ancient city wall, which forms the central element of the composition, creating a continuous landscape that physically links the park and plaza together. The fluid language of the design, by inference and analogy, acts as a catalyst by promoting fluid thinking and interaction across all the design disciplines, whilst also encouraging the greatest degree of interaction between the activities of the Plaza and the public. In an increasingly dense urban fabric, residents become further disconnected from the origin of food they consume. Urban vertical farms challenge this disconnect, often through challenging design. Emerging architect Scott Johnson has hyperlocalized the vertical farm into a program that supports the tower’s residences with a tiered farm in the core of the building. Hertl Architekten unveiled their completed project for a design agency and apartments situated directly on the bank of the river Enns in Austria, the site offers a meadow with old fruit trees and a view to a forest slope above the water in the west. The house for a design agency and an apartment moves close to the street in the east. It’s nearly without openings there. The building regulations allow one and a half stores. That is why diagonally roofs determine the form of the design. They are arranged as three layers of different length and hereby react on the scape of the site and the internal functions. The sculptural volume is covered with a concisely surface made of a black rubber film. 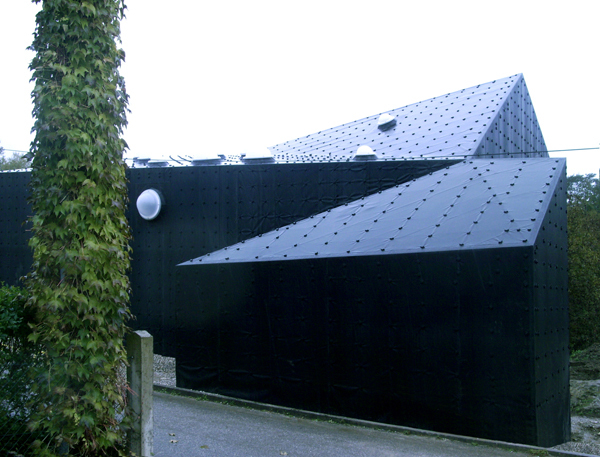 It is roof and façade at the same time and it plays with the analogy to the media industry. Light domes of different dimensions are scattered over the surface, meant as a metaphor of water droplets. They illuminate the office and emphasize on the black covering.